Log your food and track your nutrition of 90 nutrients including calories, macros, vitamins, minerals, omega 3's and antioxidants. Wholesome also offers tracking of 40 antioxidants (e.g. Lutein, Lycopene, Beta Carotene, etc.) that are missing from SuperTracker. The data in Wholesome is sourced directly from the USDA so you will have access to the exact same great scientifically sourced nutritional database. Wholesome was created by a cancer survivor to help people take control of their health through good nutrition. If you’re tired of spending copious amounts of money on skin products, look no further. Save money by simply changing your diet for the long run to have radiant, soft and glowing skin just by eating a healthy and delicious plant based diet! Did you know that our skin can often predict our health status and it is linked to the foods we place in our bodies? Free radicals cause damage to our skin and come from unhealthy foods, poor sun exposure, not enough sleep, and smoking. These toxic cells steal electrons from healthy atoms in our bodies and create chaos in our bodies. We can reverse these effects by adding in antioxidant rich foods which donate electrons to create stable atoms and in return, nicer looking skin. Anti-aging really is possible! Stock up on foods bursting with the nutrients listed below to eat your way to better skin. Iron is an essential nutrient for reducing oxidative stress caused by reactive oxygen species (ROS). Reactive oxygen species are unstable cells known to cause damage in the body and promote wrinkling. By adding in iron rich foods you can reverse environmental damages that promote reactive oxygen species like ultraviolet (UV) rays, pollution and alcohol. Main food sources of iron include beans, lentils, tofu, dark leafy greens and whole grains. 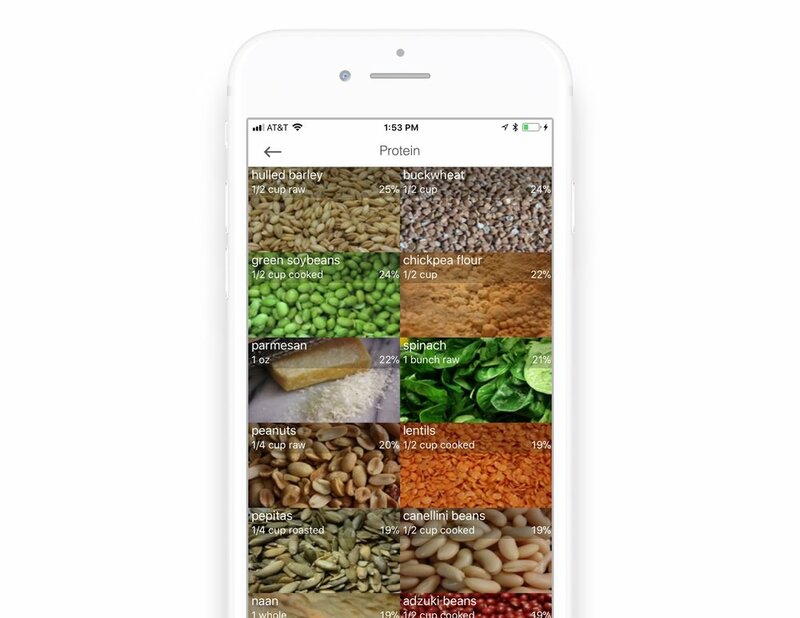 The Wholesome app is a great reference tool for finding which foods are the richest in various nutrients like iron and for allows you to track your micronutrients. Looking for the app on Android? Find out when it releases here. Beta carotene, a Vitamin A derivative, is found to reduce erythema, a condition where the skin becomes red from dilation of blood vessels. Erythema is often caused by UV rays, medications, pregnancy and multiple medical conditions. Astaxanthin is another Vitamin A derivative that can be found in skin products because of its effect against wrinkling and sagging skin. Looking to add more Vitamin A in your diet? Try incorporating carrots, kale, sweet potatoes, spinach and broccoli. Vitamin C is a powerful antioxidant filled with skin fighting abilities. Studies have found that people with Vitamin C deficiencies often have higher chances of wrinkled and damaged skin! Dermatologists recommend it due to its role in collagen production in the body which creates elasticity in your skin. Still not convinced this antioxidant is a must have in your daily diet? Vitamin C is also found to help with reducing skin pigmentation changes by donating electrons to help stabilize free radicals in our bodies and prevent further destruction to our cells. Foods containing Vitamin C include strawberries, kiwis, oranges, papayas and bell peppers. This trace mineral is found highly concentrated in our skin and is a key micronutrient for repairing tissue. This mighty mineral is also well known to reduce inflammation, help with skin pigmentation conditions and treat infections. People with severe acne are sometimes prescribed Zinc sulfate as an oral treatment to reduce breakouts. Find an abundance of Zinc in spinach, cashews, pumpkin seeds, beans and mushrooms. Long chain Polyunsaturated Fatty Acids, or PUFA for short, help with creating tissue lipids and reducing inflammation from UV rays. If you’re looking for more subtle skin and reduced wrinkle formation, load up on fatty acids to reduce dryness! Foods high in essential fatty acids include sunflower seeds, walnuts, oils, dark leafy greens and whole grains. Often found in proclaimed “super foods”, polyphenols are micronutrients filled with antioxidants that maintain cell survival and fight disease. Resveratrol, a common polyphenol found in wine has anti-aging properties by creating new cells and preventing collagen from breaking and losing our skin’s natural shape. Topical green tea polyphenols contain other skin fighting properties that help with reducing inflammation, erythema and UV damaged edema. Try incorporating cocoa, berries, walnuts, green tea and grapes into your diet for more polyphenols! Niacin, Niacinamide, nictonic acid or B3, there are many names this multiverse vitamin goes by. From strengthening skin to improving dryness and reducing damage you can count on niacin to do all the above! Make sure to stay within the RDI limits however, as overdosed levels can result in reddened skin. Add niacin rich food sources like peanuts, mushrooms, sunflower seeds, peas and avocados to your meals today. If you keep forgetting your sunscreen (although I highly suggest you apply it daily), try integrating the trace element Selenium into your daily routine. Selenium has a photoprotective effect which helps keep our skin from damaging against harmful UV rays. Sunburnt skin results in wrinkling, so make sure to load up on brazil nuts, chia seeds, mushrooms, beans or brown rice for added protection. Say hello to Vitamin E, an antioxidant known to neutralize free radicals in our bodies and impair skin. Vitamin E does this by preventing free radicals from causing destruction in lipid cells. When deficient in this vitamin our body can cause edema (swelling due to fluids accumulation), dry skin and depigmentation. Add in Vitamin E rich foods like almonds, spinach, sweet potatoes, wheat germ and sunflower seeds for all the benefits mentioned! Vitamin D is known to protect our skin from apoptosis and blocks stress activated protein kinases to stop our skin cells from dying. Studies even suggest that Vitamin D may protect us from skin cancer. If you have wounds, Vitamin D is essential to induce repair and healing. Other than the sun, mushrooms, fortified milks, fortified cereals and oatmeal are other excellent sources to include in your daily diet. Although you can get these nutrients from USP certified supplements, it is always best to eat whole foods due to added health benefits such as fiber and to prevent toxic overdosing. 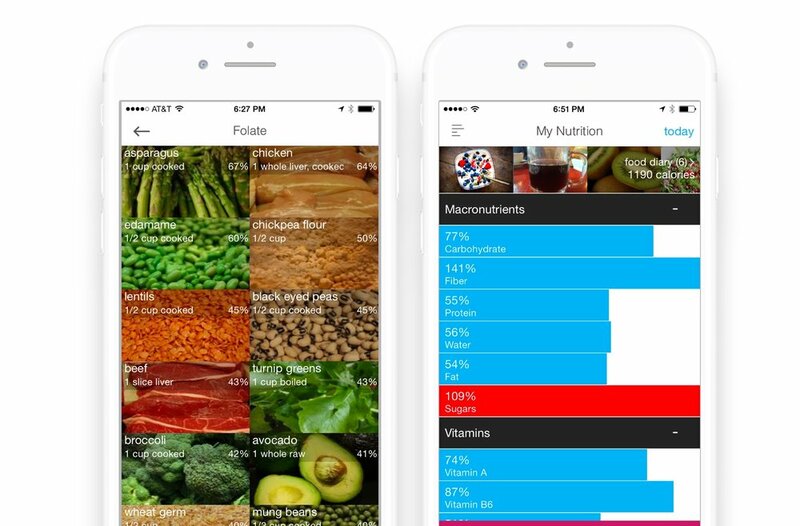 Use the Wholesome App today to determine recipes rich in the top 10 micronutrients listed above or to track your diet to see if you are meeting your daily nutrient requirements! The Wholesome App even includes recipes and scores them on how healthy they are so you can be confident knowing the meals you made are nutrient dense. If you notice micronutrient deficiencies or skin problems arising please see a Registered Dietitian, Dermatologist or Doctor for further information. Whether you are trying to simply improve your health or lose weight, a plant based diet can be a great way to achieve your health goals. While it can seem overwhelming to give up animal products at first, your body will thank you in the long run! The great news is you do not have to do this alone, the Wholesome app can assist with this transition by allowing you to make the best food choices while meeting your vitamin and nutrient needs. Wholesome was created to help those on a plant-based diet spot nutrition gaps and ensure they are getting all the micronutrients their body needs. 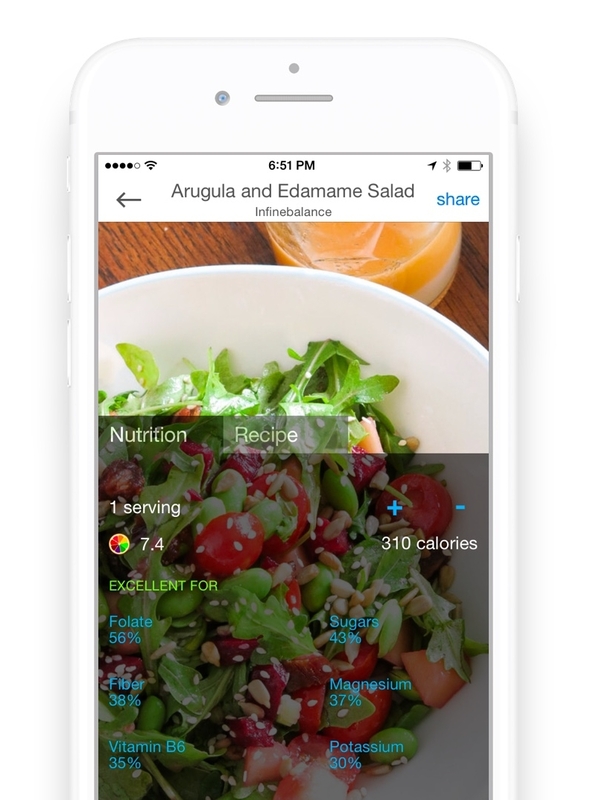 The app tracks over 90 nutrients including antioxidants and omega3s. You can set your own customized nutrition goals or rely on what the USDA recommends for you. And if you're pregnant the app will adjust your targets for the needs of eating for two. It may go without saying, but in order to truly follow a plant-based diet, you have to eat plants. Fruits and vegetables are rich in vitamins and minerals while being naturally low in calories, making them the cornerstone of any healthy diet. Not only is it important to eat at least 5 servings a day of fruits and vegetables each day, but it is also important to eat an assortment of different varieties and colors. Color is associated with active compounds in our fruits and vegetables which have been suggested to provide healthful properties, so it is important to eat many different colors. The key to getting the most out of healthy eating is variety. Sadly, not everything that is vegan or vegetarian is healthy. This means it is more important than ever to start reading labels and making educated food decisions. The fact that something does not contain animal products, such as dairy, eggs, meat, poultry, or seafood, does not mean it isn’t full of sugar, fat, and added salt. For example, Oreos are vegan because the “cream” is oil and the cookie was made without milk or eggs- but no one would argue an Oreo is good for us. Read labels and compare which products are least processed and contain more fiber, vitamins, and minerals. Remember, the Wholesome App can assist with tracking and making better food choices. Carbohydrates get a bad rap, but the truth is many foods associated with being higher in carbohydrates, such as whole grains, contain important B vitamins, iron, fiber, and so much more. The “Whole” in whole grains means that the seed of the plant is intact and less processed than other foods. Not only are they part of a balanced diet, but dried grains often store well in the pantry, making them a must-have to keep around. There are so many ways to eat whole grains other than just whole wheat bread or pasta. Barley is great in soups and stews, quinoa makes a great cold salad, and of course there is nothing like a hot bowl of oatmeal for breakfast. Brown rice, couscous, popcorn, amaranth, rye, farro, and so many other whole grains are just waiting for you to try them. As I have stated, variety is such an important part of any diet, but especially when going plant-based. Challenge yourself to try new things every time you go to the grocery store in order to explore all the different fruits, vegetables, grains, and legumes that make up a plant-based diet. Often the foods we don’t like are because we had those foods poorly prepared years ago and have never tried them again. This is your chance to give those foods and even more a chance! Not only will trying new things benefit your health, but it may benefit your wallet. Trying foods in season often means they cost less. As an example, the fresh strawberries you usually buy may be over $5.00 a carton in the winter, but pomegranate is in season and 2 for $5. Of course the availability and exact prices vary by geographic region, but there will always be something new. Often times, before beginning a plant based diet the most experience anyone has with beans is the canned baked beans at summer bar-b-ques. Beans, which are a legume, are high in plant based protein, as well as fiber. Depending on the type, beans can also be excellent sources of folate, B Vitamins, copper, iron, manganese, and magnesium. There are a wide variety of beans all with different flavors and uses available to add protein and nutrients to any meal. Changing your diet can be overwhelming, but use these tips to make the transition a little less daunting. By switching to a plant-based diet you are already making valuable steps to improve your overall health, and with the Wholesome App you can search recipes, tips, and view your personalized nutrient needs to make the process less challenging. You’re exercising, getting enough sleep and eating what you think is a healthy diet, but you still feel lethargic throughout the day. A common challenge for most individuals is getting past the 3pm energy slump. Naturally, our energy dips after eating a meal due to the energy required to digest and uptake the nutrients from the foods we most recently consumed. 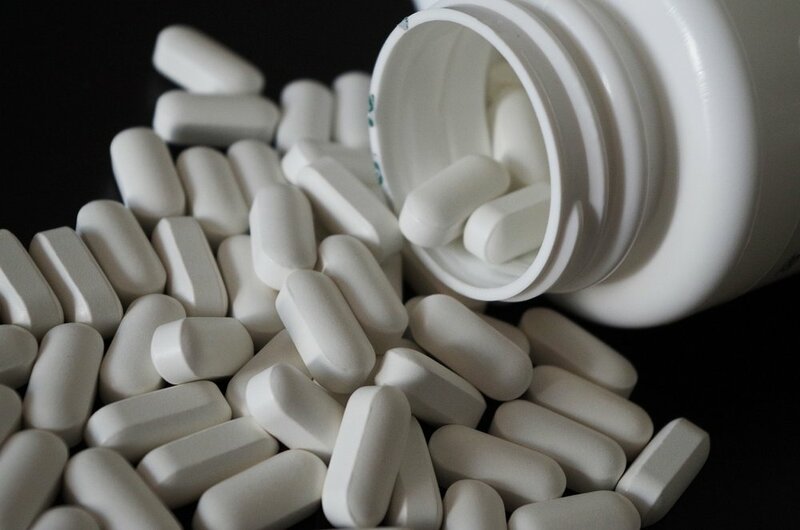 Did you know that not all folic acid supplements are safe? Most prenatal vitamins on the market contain a type of Folic acid that is hard to metabolize and can result in a build up of toxic chemicals. Find out how to avoid these and what to look for in your prenatal vitamin for the safest and healthiest pregnancy. As a vegan it can be more difficult to get enough protein in your diet. Find out the top 25 plant based foods according to the USDA and track your protein intake using the Wholesome app. Maintaining the right diet is extremely important during pregnancy. According to articles from the BBC and Time Magazine, it can impact a baby’s heart risk and help mitigate a lifetime of cancer risk. The Wholesome app is the best tool to monitor your intake of key nutrients during your pregnancy. Folate (usually referred to as 'Folic Acid' or Vitamin B9) is essential for a healthy pregnancy because it protects against neural tube defects. According to the National Institute of Health, if you are pregnant or trying to conceive, your daily folate requirement increases from 400 mcg to 600 mcg (source: NIH). Few know that it is best to avoid synthetic folic acid supplements and instead eat a diet rich in natural folate instead. Why is that? Folic acid is actually the synthetic, man-made form of folate, which can be found abundantly in whole foods. A subset of the population has trouble metabolizing folic acid. For these people it can stay in the body and even do harm, a process that several studies have linked to cancer. Folate, in contrast and even in excess, is perfectly safe - for more information, read more here. Are you getting enough folate from your diet for a healthy pregnancy? The Wholesome app can help you get what you need from your diet and visualize your progress tracking toward your 600 mcg goal. Simply update your profile to 'pregnant' and the app and it will set your goal to 600 mcg per day. You can also customize your goal higher should you desire to do so. Want to know how much folate is in your recipe? You can add the recipe to Wholesome and it will analyze it for 90 nutrients. It also generates a score out of a possible 10 points to give you a sense for how nutritious and healthy the recipe is per the calories. Click on the menu icon on the top left, then click on "My Profile". Change the setting to Pregnant as shown on the right. 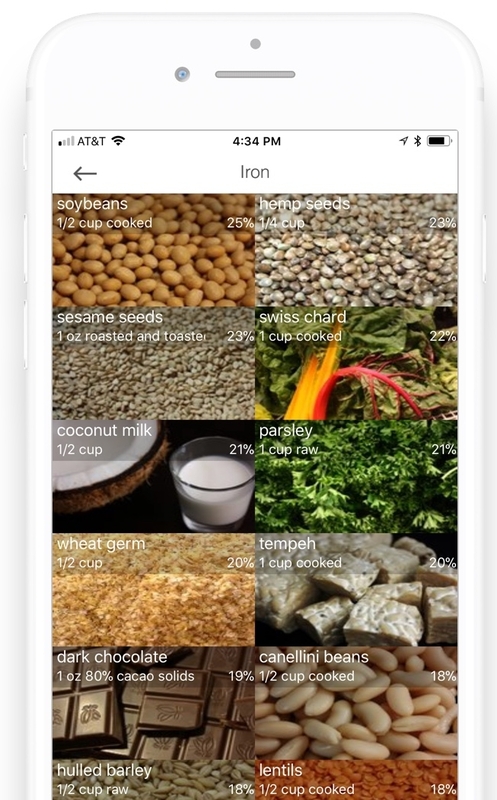 The app will auto-adjust your nutrients goals for the recommend amounts for pregnancy, such as 600 mcg of folate per day and 27 mg of iron per day. To customize your goals further, click on the 'daily goals' tab and click 'edit goals'. Folic acid is the synthetic form whereas folate is the natural form commonly found in whole foods. After ingesting the synthetic form, it must go through a complex metabolic pathway in order to turn it into the useable form, folate. But not everyone is able to process folic acid properly. Read more in my post about the differences between folate and folic acid. 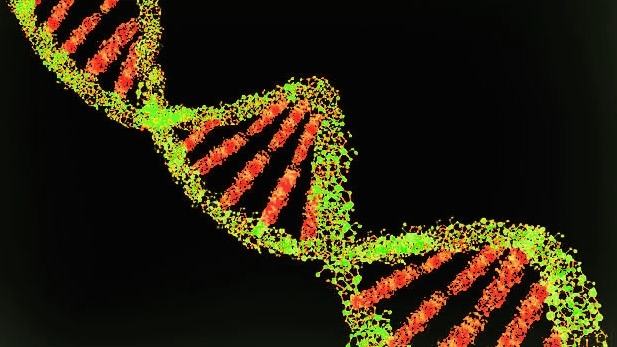 I also recommend that you find out whether you have any genetic variants in your MTHFR gene that would impact your ability to process folic acid - find out an easy way to check for the variant in my post here. Want to know how much protein is in your recipe? You can add it to Wholesome and it will analyze it for 80 nutrients. It also generates a score out of a possible 10 points to give you a sense for how nutritious and healthy the recipe is for the calories. According to the NIH, adult men need 8 mg of iron per day, women need 18 mg per day, and pregnant women need 27 mg per day. Adding 50 mg of vitamin C to an iron-rich meal may make it possible to double or triple the absorption of iron. Warning: Iron supplements represent one of the most common poisoning risks in children. Click on the menu icon on the top left, then click on "My Profile". Change the setting to Pregnant as shown on the right and then recalculate your goals. 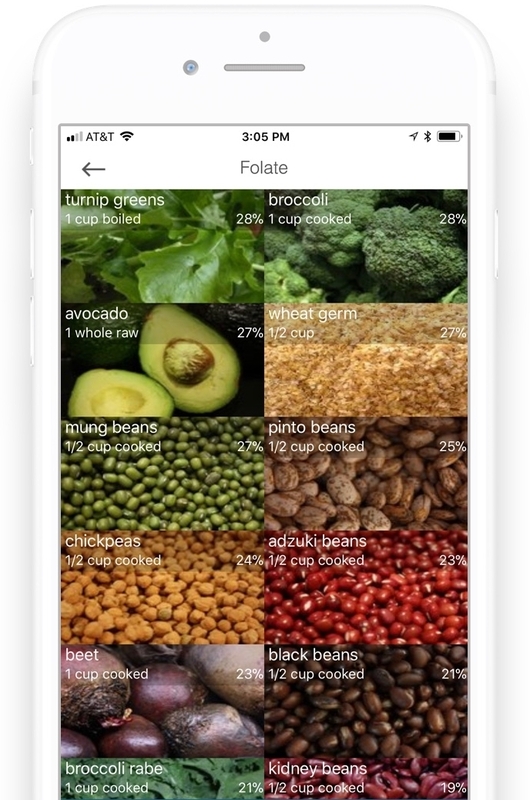 The app will auto-adjust your nutrients goals for the recommend amounts for pregnancy, such as 600 mcg of folate per day and 27 mg of iron per day. To customize your goals further, click on the 'daily goals' tab and click 'edit goals'. Wholesome analyzes 80 nutrients in foods and recipes including micronutrients, phytonutrients, omega 3s (like DHA), and antioxidants. You can track what you eat and monitor your progress against your nutrient goals. The app also has healthy recipes and scores them out of a possible 10 points for how healthy it is. You can add your own recipes or pin them from the web to get nutrition information. We've had many questions about how Wholesome personalize's your nutrition goals and why the %'s in Wholesome don't always match up to the %'s on nutrition labels. We're going to explain exactly how it works in this post. In order to print the daily value for each nutrient on a nutrition label, the food industry has to standardize the recommended amounts. The problem is that we all have different nutritional needs depending on personal factors. For example, women are recommended by the USDA to have 2x more iron than men each day and pregnant women are recommended to have 3x more iron than men each day. The food industry sets 18mg of iron as 100% across all nutrition labels (since they only have space to print one value on the label). But adult men only need 8mg per day, while a pregnant woman needs 27mg per day. So if an adult man was to get 100% of the nutrition label, he would actually be getting more than double what is recommended. While the pregnant woman would only be getting 2/3s of what she is recommended to have. Wholesome takes all your personal factors into consideration and tailors your daily goals according to the USDA recommended daily allowances recommended for you. All you have to do is enter in your profile information within settings. Here is another example. The food industry sets 100% Vitamin B6 as 2mg on nutrition labels. Because Wholesome is a digital experience (instead of a static nutrition label), Wholesome can adjust your daily goal for each nutrient based on any your age, gender, and pregnancy status. Let's assume you are entering a Vitamin B6 supplement into Wholesome as a custom food. The nutrition label says that 100% daily value for Vitamin B6 is 2mg and you enter that into Wholesome. Because Wholesome is more precise based on your age and gender, it knows that you only really need 1.3mg. Thus, Wholesome will show the Vitamin B6 supplement that you entered as 154% of your daily Vitamin B6 for that day because it is based on your personalized target rather than showing 100% which is the non-personalized industry standard. If you're a woman of childbearing age you know that every medical appointment includes a recommendation that you take folic acid supplements. The reason for this is simple, too little folic acid has been proven to cause severe neural tube defects in a developing fetus. While all doctors know that too little folic acid is harmful, they generally do not know that too much folic acid may also have toxic effects as well. Luckily, there is a safer alternative: folate. Folic acid vs. Folate - what's the difference? Folic acid is a synthetic form of folate that is found in supplements and fortified foods, whereas folate is the natural form commonly found in whole foods. Both folic acid and folate go through their own metabolic pathway to turn them into the bioavailable 'final' form of folate, called methylfolate (5-MTHF). Ultimately, methylfolate (5-MTHF) is what your body needs to be healthy. A large subset of the population with certain variations in the MTHFR gene are unable to fully breakdown both folic acid and folate into its final state, methylfolate (5-MTHF). That means you may not be getting enough methylfolate even when you're taking the recommended amount in your supplement because your body cannot process it properly. The easiest way to find out if you have a MTHFR mutation is to ask your doctor to run a panel or to do it on your own have your DNA sequenced by 23andme and then follow these instructions. I recently did both and found out that I have a compound heterozygous mutation in this gene which simply means that I have a 50% reduction in my ability to break down folic acid into methylfolate. When you ingest large amounts of synthetic folic acid found in supplements and fortified foods, some of it may not be metabolized into methylfolate and it may run free in your body. The un-metabolized folic acid (called 'UMFAs') may be toxic as some studies have found that theycontribute to the development of several types of cancer. While too much synthetic folic acid results in UMFAs, too much folate from whole foods does not create UMFAs and is not harmful to your health. Thus, folate is the safer alternative. The research is ongoing and not fully proven yet but there is compelling evidence building that UMFAs are harmful. In one study, supplementation with folic acid was found to be associated with an increased risk of breast cancer (1). Another study found a higher rate of prostate cancer in those supplementing with folic acid (2). In 2012, a study found a correlation between the childhood eye cancer called Retinoblastoma with folic acid intake of the child's parents. Mothers who took folic acid supplements while pregnant and had the genetic MTHFR mutation in which they could not turn folic acid into folate, were 4 times more likely to have a child with Retinoblastoma than the control. The study found that “both insufficient folate intake and increased folic acid intake have been associated with the development of carcinomas in adults and with the promotion of neoplastic lesions and genetic damage in rodent models" (3). In sum, your body's goal is to convert both folic acid and dietary folate into methylfolate (5-MTHF) which is the form that can be used by your cells. Unmetabolized folic acid (UMFAs) is a product of folic acid ingestion through supplementation and food fortification that may result in potential toxic effects. A better alternative is dietary folate (through foods and supplements made from whole foods), which is safe even in excess amounts. Both folic acid and folate are affected by MTHFR mutations and may reduce the conversion to methylfolate (5-MTHF). If you have a MTHFR mutation it is best to increase your dietary folate. You may also consider taking a supplement directly in the form of methylfolate. In this article, find out which of the 5 best folate supplements will work best for your situation. Don't be surprised that your doctor does not know about the dangers of folic acid nor that there is a simple and safe alternative: folate. The vast majority of doctors do not receive nutrition education in medical school, so they never learn the difference between folic acid and folate. After explaining to one of my doctors the reasons why I would not take folic acid supplements, he responded saying "I need to learn more about nutrition". What your doctor learned in medical school (which is true) is that too little folic acid can cause terrible birth defects and that's why they push the folic acid supplements. They are generally not aware that too much folic acid may have serious consequences, especially for those with a MTHFR mutation. So the next time your doctor recommends taking folic acid, take folate instead. Remember they both are converted into methylfolate (5-MTHF) so it's the same thing, just safer. You can get folate by eating whole foods (the Wholesome app ranks which foods are the most rich in folate) or by taking a whole food supplement. After doing heavy research into supplements, here are the 5 best folate supplements that I recommend. Unfortunately saying no to folic acid supplements is not enough to avoid it. If you eat any breads, pastas, rice, cereals, or flours, they are all fortified heavily with folic acid. Since 1998 the FDA has been fortifying with folic acid mandatory with the goal of reducing birth defects. But it is likely that too much folic acid in our diets is causing harm especially if you are eating these things everyday (4). A 2009 study looked at colon cancer in Chile before and after the start of the flour fortification program with folic acid and found that "fortification programs could be associated with an additional risk of colon cancer" (5). So what do you do when too little folate causes birth defects and too much folic acid may increase your risk of cancer? 1. Avoid folic acid and get as much folate from whole foods as you can. There is no danger in eating too much natural folate like there is with folic acid. Folate helps the development of red blood cells, reduces levels of homocysteine in the blood which supports cardiovascular health, and it supports nervous system function. 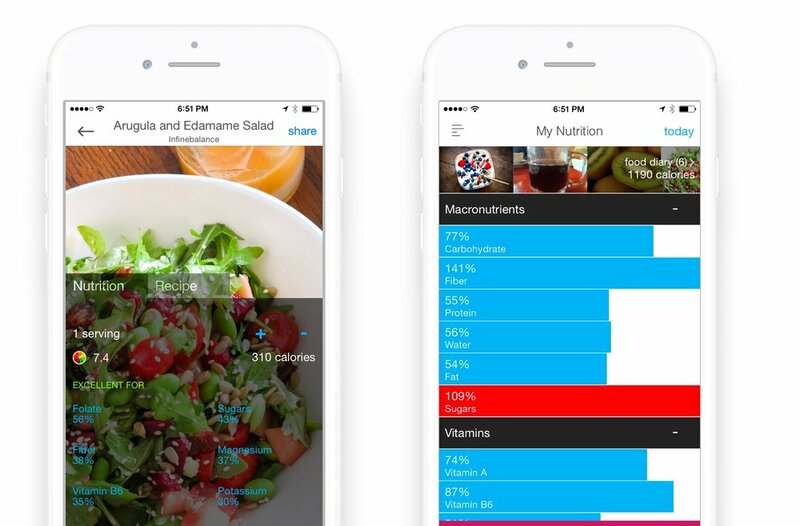 The Wholesome app can help you get know if you're getting enough folate in your diet. It allows you to track toward the USDA's recommended goal based on your age and gender. It also has an easy access list of the foods with the most folate. If you are pregnant or trying to get pregnant you will need need to increase the amount of folate in your diet from 400mcg to 600mcg (source: NIH). In the Wholesome app settings, simply update your profile to 'pregnant' and the app will set your goal to 600mcg per day. If you have a MTFHR mutation, you should set your goal higher as not all of the folate that you eat will be absorbed. 2. Have a blood test performed by your doctor to measure your actual level of folate. I had this done recently and found out mine were way above the recommended amount (finally some validation that I don’t need those pills!). Your doctor may also run your homocysteine level which is an amino acid that can be elevated when you are deficient in folate. High homocysteine levels can put you at risk for cardiovascular disease (source). 3. Find a better folate supplement. If your levels of folate are low or you are trying to get pregnant find a supplement that says 'folate', '5-methyltetrahydrofolate', or '5-MTHF' on the label and avoid anything that says 'folic acid'. After doing my own research, I have found that these are the 5 best folate (prenatal) supplements. Before you buy, read the nutrition label because most multivitamins contain folic acid. 4. Assuming you are getting enough folate, avoid packaged goods with folic acid listed on the label – that probably means less cereal and energy bars. Sometimes the labels are confusing, for example, cliff energy bars list “folate” under vitamins but then in the ingredients it says “folic acid”. Eat whole foods instead. 5. Find out if you have a MTHFR mutation that can impact your ability to metabolize folic acid and puts you more at risk. Here is an easy way to find out if you have a MTHFR mutation. At a minimum, do your best to get natural folate from whole foods rather than simply relying on folic acid supplementation.